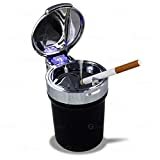 The Zone Tech Ashtray is a great way for you to be able to enjoy a cigarette without having the heavy smell remain in your car home or office. The classic black holder has cool blue LEDs that light up when the cover is lifted casting an amazing glow. Its compact size makes it a wonderful item for travel and it can easily be placed in the car cup holder for practical storage. ENJOY A CIGARETTE – The Zone Tech smokeless ash tray allows you to have that smoke while still creating a “smoke free” zone. You can totally enjoy a cigarette in your car home or office without having the intense smell linger. PREMIUM QUALITY – The Zone Tech smokeless ash tray is constructed out of premium quality material to provide you with a sturdy, durable and long lasting tray. It is designed to fit into any standard size cup holders for your convenience.